On this page, you will find a working strategy to defeat Elerethe Renferal in The Emerald Nightmare for both Normal and Heroic modes, which usually only differ by the tuning of the boss. Here, we assume that you have read our descriptions of the abilities for this encounter. The other pages of our Elerethe Renferal guide can be accessed from the table of contents on the right. Elerethe Renferal is two-phase fight, in which Elerethe will swap between two different forms, Spider and Roc. This fight takes place on as many as three different platforms. It is unclear when exactly Elerethe switches form. The first swap happens around 45 seconds into the fight, while the second is closer to 2 minutes. She maintains this pattern throughout the fight. In any case the rotation will always be Spider, Roc (during which she changes platform), Spider again, and so on. To defeat Elerethe, your raid will have to manage quickly killing the Spiderling adds, as well as stacking in the designated area before Gathering Clouds is cast. The Venomous Spiderlings spawned by Elerethe will debuff their target with a stacking Nature damage debuff, Dripping Fangs as well as spawn multiple Venomous Pool. Once your raid has a good feel for these timings, the fight will become much easier. Because of how this encounter is designed this boss fight will have a lot of movement. 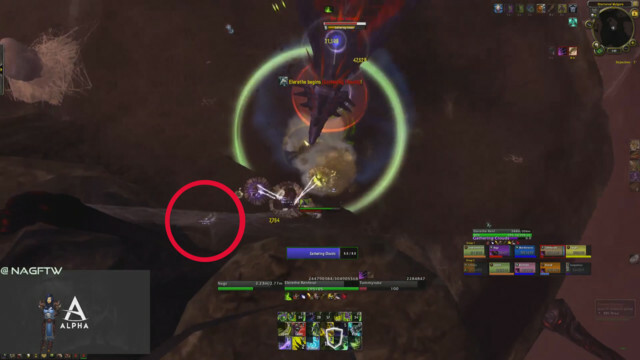 There is no one "best" position to tank Elerethe in while your raid is dealing with the Spiderlings since each platform is a little different in size and shape. You should tank Elerethe close to the natural walls on each platform. This will maximize the raid's space and ability to cope with Venomous Pool left behind by the Venomous Spiderlings. More importantly, the boss should be tanked by the wall to negate the push-back effect from Gathering Clouds at the beginning of each Roc form phase. This will reduce your raid's overall healing required, and increase your raid's overall damage. On each platform there is a small "cubby" area where your raid can stack. This should be done shortly before Elerethe begins her cast of Gathering Clouds. We have illustrated an example of said location in the screenshot below. Tanking the boss in such a position will also allow your raid to quickly pickup the Shimmering Feather left behind and move to the next platform before the boss' next ability, Dark Storm can ramp up to a dangerous point. The raid members that pickup a Shimmering Feather can also freely jump on top of the Venomous Spiderlings that spawn on the bridge leading to the next platform and Skittering Spiderlings spawned by raid members run into the egg sacs that litter the bridge. During Roc form, raid members other than the current tank should not be standing in front of Elerethe, because of Razor Wing. The most important and noticeable ability in Spider form is Feeding Time. During this ability, the Venomous Spiderlings that come down from the web needs to be picked up by the tanks and AoE'd down before their Dripping Fangs debuff stack too high. While you are killing the Venomous Spiders, you need to watch out for Vile Ambush. The effect on the ground at the location of the targeted player is very obvious and everyone needs to move away from it (including the targeted player). In addition to this, targets connected via Web of Pain should do their best to remain within 20 yards of their partner; this is to not increase the reflected damage. Finally, players debuffed with Necrotic Venom need to move away from the raid to drop their Venomous Pools where they would not hinder raid movement. While doing so, they need to be careful not to run into egg sacs (as they spawn Skittering Spiderlings. In Heroic mode, because of the interaction between Venomous Pools and the tornadoes of Twisting Shadows, the Venomous Pools need to be concentrated in the same area (with tornadoes being dropped at the opposite end of the platform during Roc form) to reduce the likelihood that tornadoes will run into Venomous Pools. Avoid dropping the pools next to a bridge, because Elerethe tends to spawn tornadoes there when she moves to another platform. Top guilds go as far as creating a single Venomous Pool by using immunities and personal cooldowns to drop them all in the exact same spot. Note that if you are expecting to kill the boss before she transforms into a Roc for the second time, then you do not need to worry too much about where to drop Venomous Pools on the second platform. While in Roc form, Elerethe's main abilities are Gathering Clouds, Dark Storm, and Twisting Shadows. Venomous Pools present on the ground do not disappear when the boss changes form. As explained in the positioning section above, the raid needs to stack for Gathering Clouds in a small cubby area (there is one on each platform), to counter the knockback effect of the ability and make it easier to heal. Players debuffed with Necrotic Venom should be careful not to stack with the raid during this ability (they should use personal cooldowns and potions to survive and healers need to pay special attention to them). The AoE pulse from Necrotic Venom would do massive amounts of AoE damage if they were allowed to stack on top of the rest of the raid. After Elerethe completes her cast of Gathering Clouds she drops Shimmering Feathers and cast Dark Storm on that platform before flying to the next. Shimmering Feathers can be picked up by any member of the raid, but should be left for vital raid members (tanks/healers) to quickly travel to the next platform. These feathers can also be used to insta-kill the Venomous and Skittering Spiderlings that may have spawned on the bridge to the next platform, making the crossing easier for raid members who did not pick up a feather. In any case, everyone should be prompt to leave the platform to avoid taking too much damage from Dark Storm. Players targeted by Twisting Shadows need to move out of the raid to drop their tornado. In the 10-second window before the tornado spawns, they can take the time to run over Venomous Pools to remove them from the encounter. In Heroic mode, you must not try to remove Venomous Pools during the 10-second window. This would cause a tornado to spawn too close to the remaining pools, eventually coming in contact with them and dealing high raid damage. Instead, you want to drop the Tornadoes on the opposite side of the platform from where the Venomous Pools have been dropped. Aside from the positioning constraints already mentioned, there are a few things to watch out for as a tank. In both Spider and Roc form, tanks need to be mindful of their stacks of Dripping Fangs when tanking Venomous Spiderlings, which spawn both during Feeding Time and during platform changes. In Roc form, tanks need to be on the lookout for the boss' casts of Razor Wing and Raking Talons and should be ready to taunt off after each stack of Raking Talons, which will be cast in rapid succesion for 10 seconds. Healing cooldowns should be saved for when Elerethe is in Roc Form. The majority of the damage the raid takes will be while Elerethe is a Roc, between Gathering Clouds, and Dark Storm the raid will be taking heavy AoE damage. It is vitally important for you as a healer to pre-position yourself before Gathering Clouds in one of the areas where you will not be knocked back, so that you can free cast during the pushback effect with no consequence. We recommend post-potting and popping Bloodlust/Heroism/etc after any platform transition. At this moment, there is a small grace period where the reduced number of mechanics prior to Feeding Time will allow for the DPS to essentially focus on the boss and do as much damage as possible. 23 Sep. 2016: Added more information about the interaction between Venomous Pools and Twisting Shadows tornadoes in Heroic mode and how to deal with it. 22 Sep. 2016: Added a note about Twisting Shadows tornadoes spreading the poison from Venomous Pools. 18 Sep. 2016: Added more details following pottm's review.